Touching the Clouds is the first in the Alaskan Skies series by Bonnie Leon. It features the fiercely determined Kate Evans. Feeling trapped in her hometown in Washington, she’s determined to become a bush pilot in the great Alaskan wilderness. On what was supposed to be her wedding day, she takes off for the frozen north. Her journey of self-discovery only starts with her arrival in Anchorage. She must then prove her worth as the only female pilot in the treacherous region. Time and again she must pit her skills against the elements and her own past in order to succeed and live out her dream. Along the way she develops relationships with two different men and must decide which to give her heart. In a way each chapter was like a TV show. The adventure was wrapped up in a chapter or two, with a few loose threads running throughout to keep the overall shape cohesive. It was also a different kind of story in that there is no human antagonist. Kate is at odds with the landscape and the weather. And in a way with her own past. The focus is most definitely on Kate and that leaves the secondary characters a bit thin. More like props to serve the overall story. Touching the Clouds is a fun read. There’s lots of adventure, and the pacing never slows. It’s well written, with an intriguingly different setting. 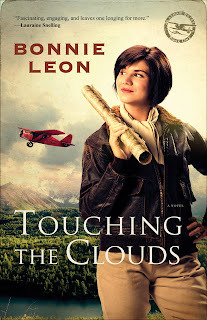 To win a copy of Touching the Clouds, leave your e-mail address in a comment. Don’t forget to put brackets around the @ sign to prevent people from phishing your address. Sounds like a nice relaxing read. Intriguing idea for a series, too! Lisa, thank you so much for introducing this one! My beautiful daughter Elsa, 19, is a pilot and of course I try to talk her out of it every chance I get. And I am NOT kidding!!! I need to read this, I think this might be God's way of helping me through my fear... seriously. Hey Cheryl. I'm praying right now for Elsa. The sky looks awfully big out there but it still fits in God's hands. Congratulations for raising such a confident young woman! Cheryl I'm praying for Elsa right now. Maybe if nothing else, reading this story will help you understand her even more. I'll have to check out her blog. BTW please post your e-mail so I can enter you into the drawing! Theresa I think you'd enjoy this story. Lots of adventure and fast paced. Not a typical romance novel. It was a little too windy to fly today, but thank you so much for praying! I am going to hang on to those prayers and use them whenever I'm feeling anxious. It is amazing how sharing the burden really helps to lift the burden! And Cheryl, my son's girlfriend flies and he can't wait to sky dive from her plane. Ack! Now, that's just a bit much for me. He's gone before and I asked him not to tell me, just to worrisome. I figure he's in God's hands. Praying for your daughter and what a wonderful adventure--flying cross country. She has my admiration. Ooh, this book sounds fun. Thanks for introducing me to a new author, Lisa! My mother-in-law mentioned once that she thought it would be fun to skydive once. My husband and his brother bought her the opportunity and went with her for her birthday a couple years ago. My understanding is that she said. "Never again!" But both my husband and b-i-l have said they'd do it again if given the chance. Hubby asked if I wanted to go to. "Uh, no thanks!" And the winner is CHERYL!! I'll e-mail you to get your snail addy! A really great review! I chose it as one of my top reviews of this book on my blog. Touching the Clouds by Bonnie Leon had numerous tricks and turns that kept me turning one page after another well into the night. If you enjoyed Touching the Clouds, you might be interested in the contest Bonnie Leon is running on her web site right now to promote book two, Wings of Promise. The winner receives a $350 Escape to Alaska prize package with some really cool gifts in it.